A collection of fifteen spirited original songs that breathe life, comprehension and fun into basic grammatical and structural objectives that are first studied during Spanish I and again reviewed during Spanish II. 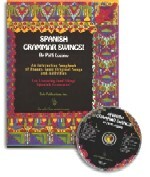 In this interactive songbook, students practice vocabulary and structures by means of improvisation, role play, question & answer phrases, echo patterns, partner songs and other techniques. There is a wide variety of musical styles franging from bolero to Broadway, blues to bluegrass, swing to Calypso.